Ron Northcott was Alberta curling in the 1960s. From 1963 to 1969, Ron (AKA "The Owl") won the Alberta Tankard six times, five as a skip. He went on to win the Macdonald Brier in three of those appearances, ('66,'68 and '69) following each with a victory at the World Championship, including the first ever Air Canada Silver Broom in 1968. Those Brier championship rinks each had a different third (George Fink, Jimmy Shields and Dave Gerlach), but the dominant front end of lead Fred Storey and second Bernie Sparkes were there to set up every end and sweep every last rock. Ron will share his thoughts on some of those great final shots, along with his approach to strategy and early use of the corner guard. We'll discuss Pee Wee Pickering, Hec Gervais, Ray Kingsmith, Warren Hansen, and Sam Richardson, in likely the greatest Curling Legends example of gamesmanship... in an elevator. 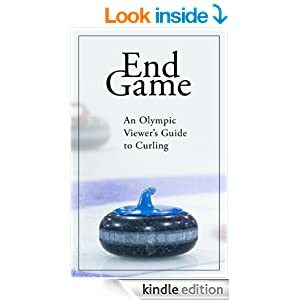 For more on Ron Northcott, check out "The Brier" by Bob Weeks, "Curling: The History, The Players, The Game" by Warren Hansen, and "The Stone Age" by Vera Pezer. Curling Canada has historical videos from the 1964, 1966, 1967, 1968 and 1969 Macdonald Briers available on YouTube. 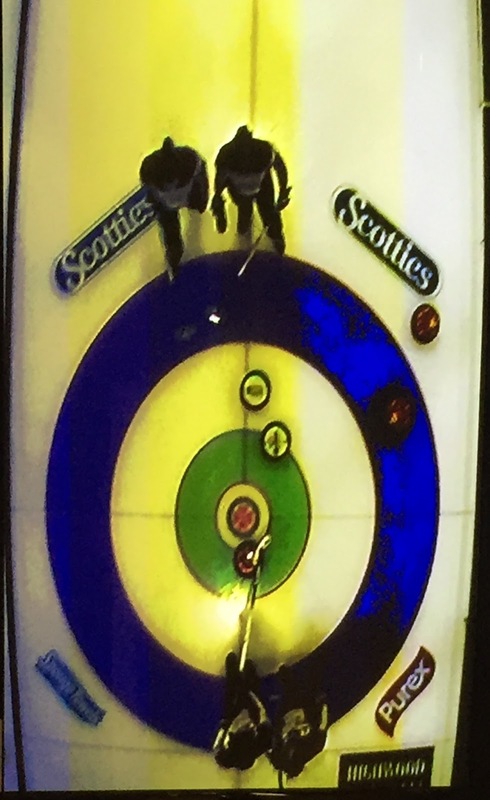 Ron is joined on stage by the Richardsons during the World Mens Curling Championship in 2009 (Part 1, Part 2, Part 3 and Part 4). There's also a short interview with Ron as part of the Alberta Sports Hall of Fame. Yes, it's been a while since I've put finger to keyboard. My new project, the Curling Legends Podcast, has been taking up most of my non-family, non-work time this curling season. I've been hoping to get out a few articles but frankly haven't even watched much of the Grand Slam this season (though it's all sitting on my PVR). That Edin squad looked tough to beat early in the season and the Casey Scheidegger rink provided a rare "underdog" story by winning their first Slam in their first appearance, after qualifying in a previous event. A reminder that maybe we need more access to the Slams. I've always felt some type of play-in process (like "Monday qualifiers" in the PGA Tour) would be great for the sport. Not certain a single Tier 2 event during an early Slam is the best solution, but more avenues for young developing teams to gain entries to these big showcase events would be fantastic. Speaking of Tier 2 teams. The Glenn Howard rink found themselves in the minor league portion of this seasons Tour Challenge, but despite their form this season and the age of their veteran skip, after the dust cleared at last week's Ontario Tankard, they were on top yet again. I've had a few Legends mention to me that the old time players like Ken Watson used to come out for games with their crests on their sweaters. Helped to remind their competitors who they were playing. Got me thinking that if Glenn Howard comes out with all of his Purple Hearts (17) on his jacket, the weight would make it difficult for him to stand erect. Unfortunately, Howard's path to the Brier was paved by the apparent collapse of Team Epping. I say apparent, because without watching, I can't say for sure. I was unable to watch these games, due to some strange licensing contract that forced those of us from out of town to pay for streaming services. I'm not against paying but I was unsure whether you were required to watch live only or if a recorded copy of the game would be available to me afterwards. Actually, being from Winnipeg I'm also notoriously frugal and $15 per game seemed excessive (though maybe it was $15 for the event, it didn't really explain). Here's hoping Sportsnet provides coverage again soon. You have to feel for John and his team. Up 5-3 without (against Howard in the 1vs2 game), and playing the 8th end, they should win about 81% of the time. In the semifinal, a 6-1 lead with 6 ends remaining should result in victory about 97%. It's not the 99.8% win expectancy that the Atlanta Falcons had in the 3rd quarter of the Super Bowl, but it's pretty close. I'm certain that Kyle Shanahan and Dan Quinn will have many sleepless nights wondering why they didn't just run 3 times into the line and kick a 40 yard field goal (Matt Bryant is 78.2% from 40-49 yards in his career). Side note, LI may have been the greatest gambling Super Bowl in history. A dramatic swing from an Atlanta win (at +3) and Under to New England -3 and Over 59 points. In fact, if NE had won with a field goal in overtime, both the moneyline and over/under would have tied. I can only imagine that would have been the largest push in the history of gambling. So the Skip Risk Factor (SRF) with a made double is +.10 but a steal results in -.20. Not certain the risk made sense but without seeing the shot, hard to judge the decision. Clearly, with McEwen reaching the Brier last year, Epping will continue holding the BPTHNWAPH belt. Just as Mike did, I'm certain John will pass it to someone else eventually. Unless of course Glenn goes to Germany to visit Kobe Bryant's knee doctor and keeps winning these for another decade. If a 39 year old quarterback can throw 62 passes and win a Super Bowl, I suppose anything is possible. 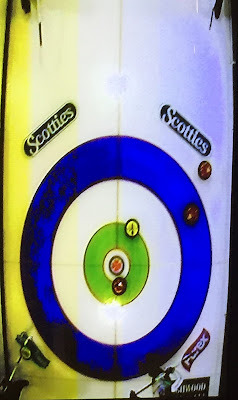 The previous weekend, I dropped by my local St. Albert Curling Club to take in the Alberta Scotties. Not certain why it wasn't held in an arena (we have a perfectly good one that was used for the Continental Cup a few years back) but sadly I am rarely asked to provide my opinion on such matters. They decide to play an angle raise on their stone in the four foot onto the Scheidegger stone at the back of the button. Not sure I agree with this call. Remember, they are tied without hammer and want to force a single by Casey or a steal. A blank is not a favourable result and they should be willing to take risks, even if it means a deuce or worse. The challenge is trying to keep their shooter for third shot and it just doesn't appear to be likely. Even with a made shot, Casey will have a double to sit 2. I suspect they were concerned that the current set-up would be easily doubled, if left as it was. 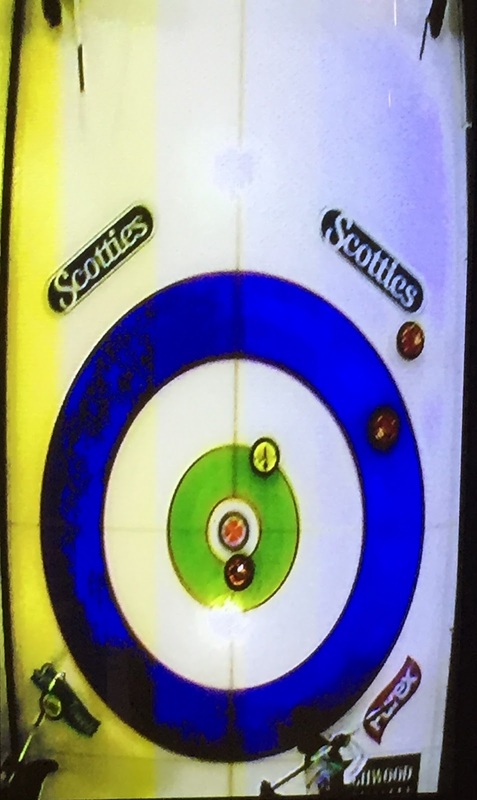 It's also possible that the amount of curl (remember, club, not arena ice) did not allow them to bury enough to the face of the shot stone with an out-turn draw. I prefer attempting the draw, throwing a guard or playing a soft tap on the target stone (rather than a hit) in order to bump it into a freeze position on the pin. I could go into more detail of the benefits or risks of each option, but I need to get back to editing next week's podcast (Dan Carey). Scheidegger eventually scored two (and went on to win). Ultimately, she had a chance at three with little risk of a steal or force. Thanks again to everyone who is listening to the new podcast. If you like it (or even if you don't), please tell your friends to listen. Please also tell your enemies, your families and tell complete strangers you meet in your everyday life. Perhaps I'll upchuck another quick article during the Scotties and Brier in the coming weeks. In Part 2 of my conversation with Matt Baldwin, we'll cover the 1958 Brier in Victoria, where Alberta landed in a playoff against a young Braunstein rink from Manitoba. Matt will share the disappointment of perhaps his best rink, when in 1960 he teamed with Hector Gervais, and didn't reach the Brier. You'll hear about Hector, Garnett Campbell, Ernie Richardson, and Matt's confrontation with Paul Gowsell in the finals of the Vernon Carspiel. Matt tells stories from the 1971 "Blizzard" Brier in Quebec City and explains how to throw a party at the Chateau Frontenac. And you'll find out why Matt is the original "Hot Shot" of one-on-one curling.